The briefest and most accurate answer to the question of how to buy a bittersweet plant is: Use caution. American bittersweet, with its yellow-husked red berries, reminds us that the warm part of fall is coming to a close. Gathered wild or from the garden, bittersweet has wreathed many doors and decorated Thanksgiving tables for years. Like families gathering for Thanksgiving, however, American bittersweet has acquired some hard-to-handle relatives over time. Shop for American bittersweet, but avoid its invasive cousins. Buy only American bittersweet. This means shopping at a reputable nursery with botanical information about your purchase. Oriental bittersweet is a much faster-growing plant that essentially strangles trees. Many states explicitly prohibit buying, selling, transporting or trading it in any form. Avoid buying bittersweet holiday decorations or household ornaments. 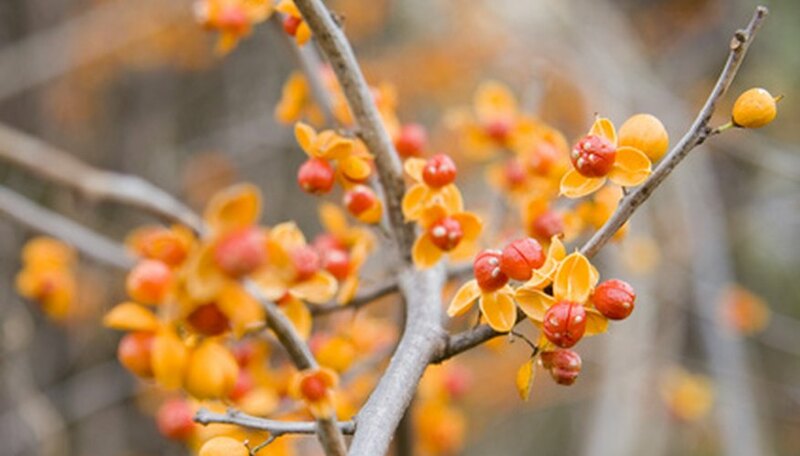 These may contain Oriental bittersweet with viable seeds, even though the decoration appears fully dried. Demand proof, if necessary, that what you are purchasing is American bittersweet. Your state conservation department, County Extension Service or local nature center can help you locate sources of native American bittersweet.